do you use spray paint or usual paintbrush paint? 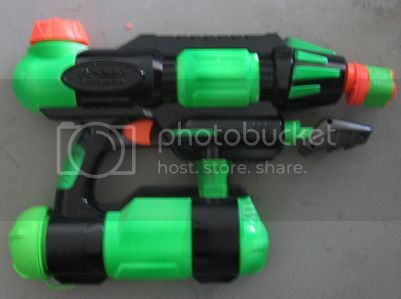 No, he only put that piece of PVC on to allow it to shoot Nerf darts. No, actually I found that extending the nozzle's length in any artificial manner may impede performance. In my Monster X's case, the sacrifice of performance was too substantial to make the "mod" worth it. I still have one in the 2007? remake blue and yellow stock colors. Baghead, very nice paintjob and nozzle mod... but why for a blaster as terrible as the arctic shock? 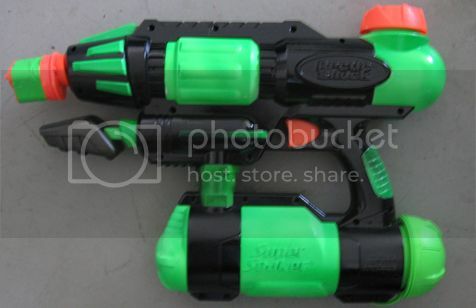 C-A_99 wrote: Baghead, very nice paintjob and nozzle mod... but why for a blaster as terrible as the arctic shock? Heh, I just noticed that the post was in 2006. Still surprising anyhow since the paintjob turned out quite well. I thoroughly modified two Arctic Blasts, and I painted them in camo.